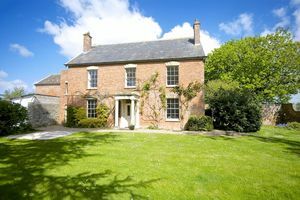 This impressively handsome Victorian farmhouse offers 6 double bedrooms and 4 reception rooms with exquisite period details throughout. 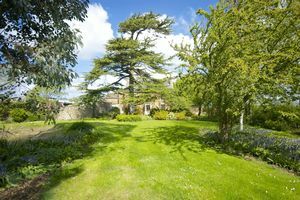 The established grounds benefit from mature planting, lawned areas, a pond, summerhouse, kitchen garden, orchard, stabling and 10 acres of paddocks. Mark is a very popular village about three miles due west of Wedmore. There are two pubs, a village stores and post office, a village hall and a very active community. State schools include Mark First School, Hugh Sexey Middle School in Blackford and the Kings of Wessex School in Cheddar. There are also excellent independent schools within the area including Millfield, Wells Cathedral and Sidcot. ENTRANCE HALL: Large wood period front door with half moon glass panel above. 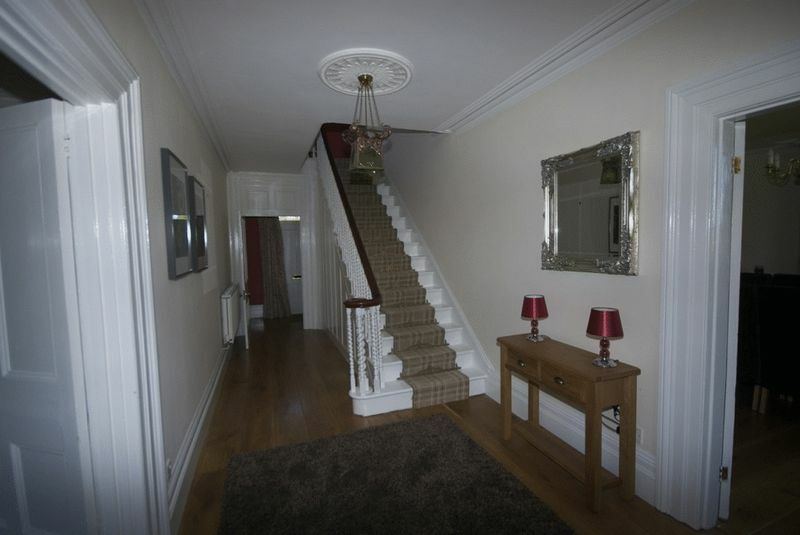 Period staircase. Under stairs cupboard housing alarm and safe. Door to rear of property and leading to garden. Oak wood flooring. Door leading to: KITCHEN: Window to the front. Fully fitted cream painted wooden cupboards, double Belfast ceramic sink, Aga, electric hob and separate oven, integral white goods including fridge. separate freezer and dishwasher. Pantry. Ceramic tiled flooring. Door back into Hall: RECEPTION ROOM ONE: Sash windows with shutter to the front. 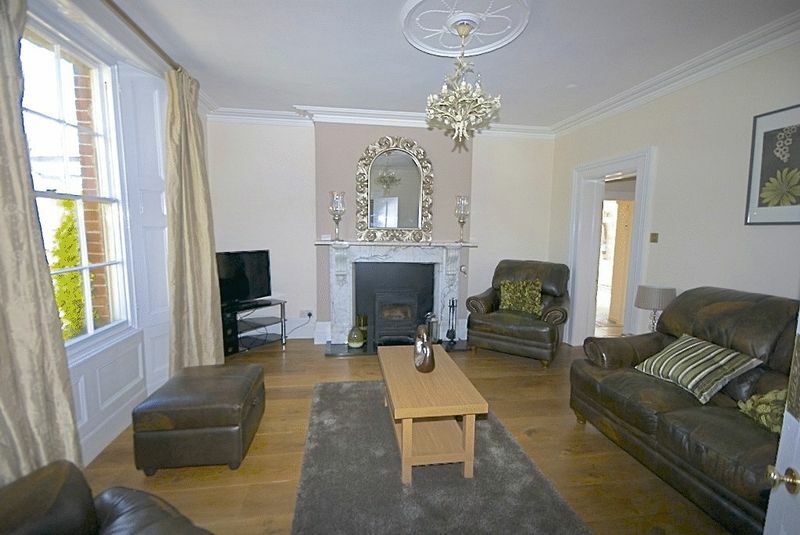 Open fire with feature fireplace surround. Oak wood flooring. Television point. RECEPTION ROOM TWO: Sash windows with shutters to the rear. Marble surround with wood burner. Oak wood flooring. 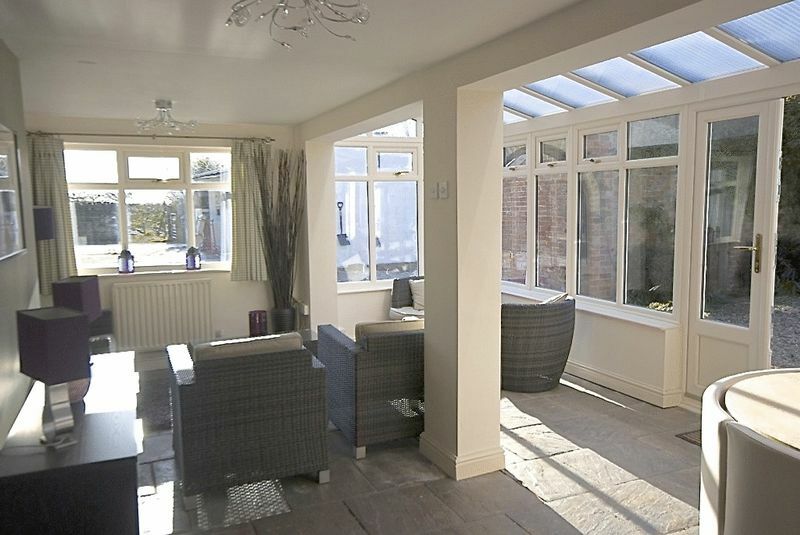 RECEPTION ROOM THREE: Sash windows with shutters to rear. Open fire with feature marble fireplace. Television point. Oak wood flooring. Door leading into Rear Lobby and Kitchen. REAR LOBBY: Door to Rear Garden. 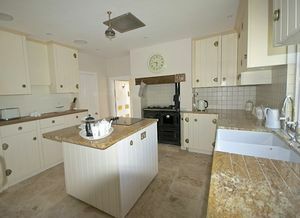 Utility area including sink and kitchen units and washing machine. CLOAKROOM: Window to side. 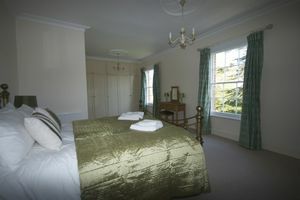 White cloakroom suite including wash hand basin.From REAR LOBBY door leading to: THE ORANGERY: Part glazed with windows to side and front. Slate tiled flooring. Television point. French windows leading Front Garden and Driveway. From the Hall, Stairs leading to: LANDING: Arch window to front with stained glass insert. MASTER BEDROOM: Sash window to rear with shutters. Full height fitted wardrobes on one wall. Marble feature fireplace. Television point. Door leading down into: EN SUITE: Original feature window to rear. 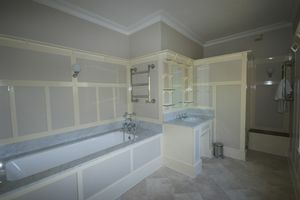 Part wood panelling.Vanity unit with sink, bath with marble top surround. WC. tiled flooring. BEDROOM TWO: Sash windows with shutters to rear. Feature fireplace. Television points. BEDROOM THREE: Sash window with shutters to front. Feature fireplace. Period built in wardrobe cupboard with hanging rail. Television point. BATHROOM: Sash window to front. Part wood panelling. Bath with marble top surround. vanity unit with sink. Separate shower with a seat at the entrance. Period wall lights. WC. Tiled flooring. From LANDING: Archway leading to Inner Hall with 2 built in cupboard with shelving. BEDROOM FOUR: Sash window to front. Television point. Door leading to En suite WC and wash hand basin. 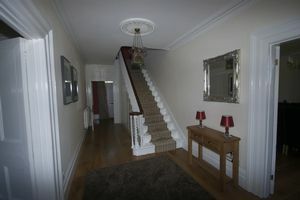 Stairs leading to SECOND FLOOR FIFTH BEDROOM: Sash window to rear. Floor to ceiling shelving on one wall. Television point.SHOWER ROOM: Shower cubicle, white WC and vanity unit with sink SIX Bedroom. Sash window to the front. Fitted Wardrobes with hanging rail and shelving. OUTSIDE: The property is approached through a cattle grid and a graveled drive. 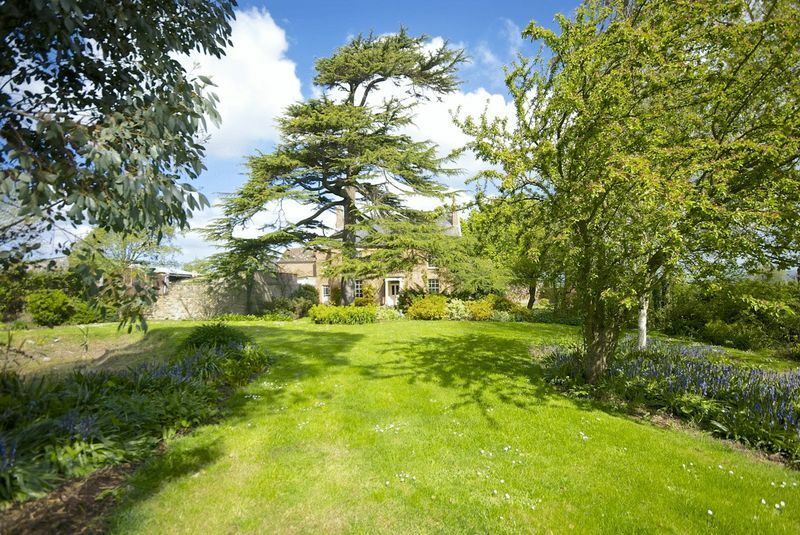 Large lawned area with mature shrubs and trees, arboretum, 2 detached garages and a brick store house. A archway at the side leads to a concrete yard with 2 stable blocks of 3 loose boxes and a covered open sided barn. Kitchen garden with raised beds, fruit canes and a apple orchard. 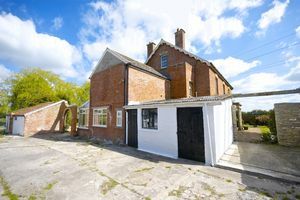 he property is approached through a cattle grid and a graveled drive. Large lawned area with mature shrubs and trees, arboretum, 2 detached garages and a brick store house. A archway at the side leads to a concrete yard with 2 stable blocks of 3 loose boxes and a covered open sided barn. 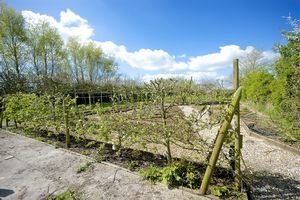 Kitchen garden with raised beds, fruit canes and a apple orchard. 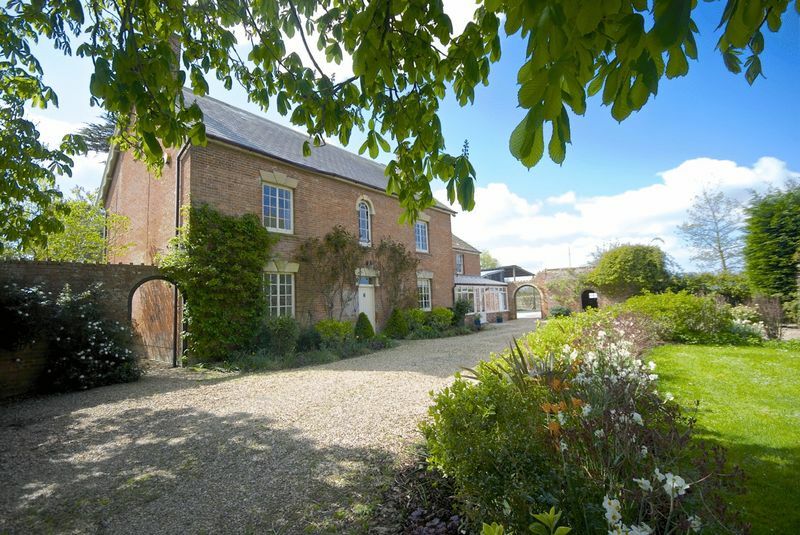 At the rear of the property,the garden is enclosed with a red brick wall, has a pond and a brick built summerhouse. 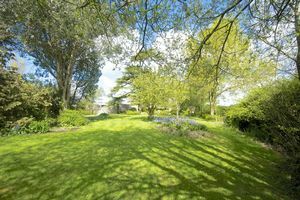 The garden is laid to lawn with established trees and mature planting and shrubs. 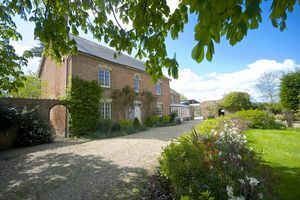 At the side and the rear of the property there are five bar gates leading to the paddocks. 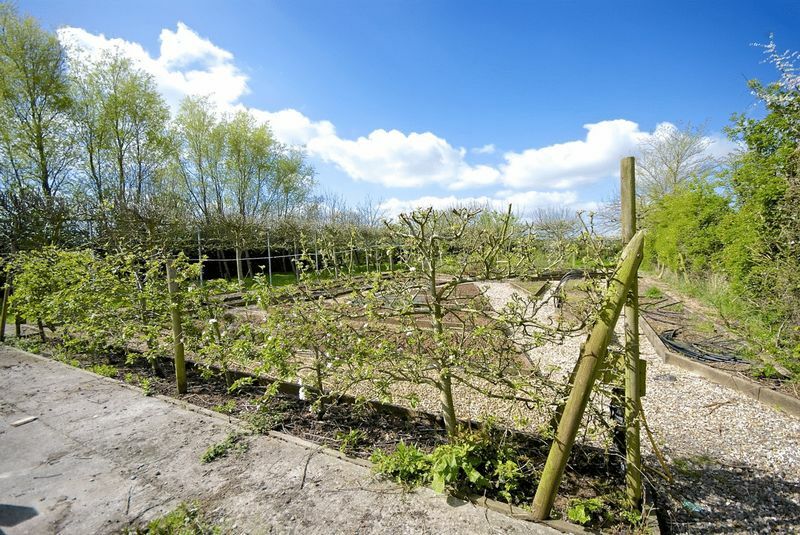 There are 10 acres of paddocks which can be included depending on the tenants requirements. Letting type: Long Term Furnishing: Furnished Or Unfurnished, Landlord is Flexible Tenant Fees: £150 for the First Tenant Application £75 for Additional Tenants.